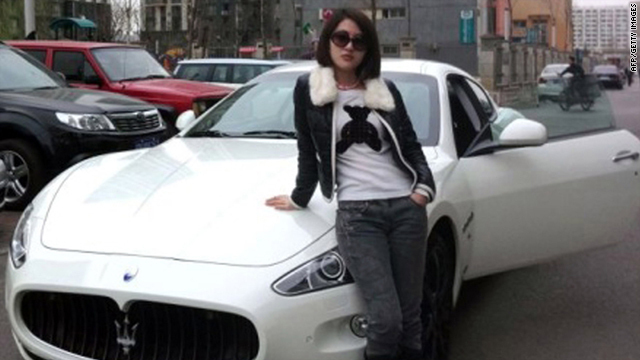 This photo posted on the internet shows "Guo Meimei Baby" in Beijing Tuesday with one of her many cars. RCSC acknowledges a "China Red Cross Society of Commercial System"
Beijing, China (CNN) -- Microblogging in China often leads to popularity -- or notoriety -- in the internet community. A few microblog posts of a young Chinese woman stirred huge controversy in China's cyberspace, putting the Red Cross Society of China (RCSC), China's biggest charity organization, and its affiliates under attack for their corruption and misuse of public donations. The microblog posts on Sina Weibo, China's Twitter-like social media site, showed Guo Meimei, a 20-year-old woman living a lavish lifestyle with luxury sports car and designer bags. While showing off wealthy lifestyle is not provocative enough to attract much criticism, the title Guo used when microblogging, however, raised eyebrows. Guo's weibo account is labeled with a "V," which means her identity was verified by Sina Weibo, and she identified herself as the "commercial general manager" for the "China Red Cross Chamber of Commerce." That prompted Chinese netizens to wonder: What is the connection between Guo Meimei and the RCSC, and did its staff abuse the public funding of the charity organization? Chinese netizens started internet mass hunting and soon dug out what they said was proof that Guo's suspected boyfriend, Wang Jun, was a board member of the Zhonghong Bo'ai Asset Management Ltd. Corp., a for-profit company connected to RCSC. However, Guo later denied on her microblog that Wang Jun was her boyfriend. Embarrassed officials at RCSC soon put out several statements on its official website, denying any relation with Guo and the Red Cross Chamber of Commerce. "The Red Cross China has always been against hyping by fabricating invalid information," said Wang Wei, the managing deputy president of the Red Cross China in a press conference on June 28, "and we hope the society will calmly treat the issue and refrained from being used." However, RCSC did admit in the statements that there is an organization named "China Red Cross Society of Commercial System," which was independent from but also advised by the RCSC. To further quell public anger, the RCSC on July 1 announced that it had invited accounting institutions to audit the finance of the China Red Cross Society of Commercial System and to investigate the alleged problems revealed by media. RCSC also decided to suspend all the work of the Red Cross Society of Commercial System until the investigation is finished. So far, the RCSC measures have failed to appease the outraged netizens. After the charity organization posted its response to the scandal on its own Sina Weibo account, more than 50,000 netizens immediately responded with angry posts, some of which demanded: "Give me my money back." Even the state-run media, such as CCTV and People's Daily, took an unusual stand to publicly question the RCSC. The anger from the public partly comes from the fact that the RCSC, which is a member of the International Red Cross, enjoyed some special privilege among the charity organizations in China. "RCSC is not an NGO," said Wang Ming, the director of the NGO research center at Tsinghua University in Beijing. "It was established by the Chinese government, and it receives funds from the Chinese government." The Chinese government still has a tight control over philanthropy in China, where only limited charity organizations have the permission to collect public donations. Among these organizations, the RCSC is usually put as the preferred recipient of donations, whenever major disasters happen and disaster relief is badly needed. Corruption charges have haunted RCSC in the past few years. A recent one came out in April, when a netizen posted a photo online claiming to show a restaurant bill for more than $1,500 for a single meal consumed by staff of a local branch of Red Cross Shanghai. Right after the Guo Meimei scandal, on June 27, the National Audit Office published the annual auditing report of 2010 which included information on the RCSC, listing five major problems regarding its finance, including an overpaid procurement contract which exceeded the approved budget in 2010. The RCSC responded by saying that the problems are not about corruption or misusing the public donations, but mainly "technical problems." "No matter what, the RCSC needs reform," said Wang, the professor at Tsinghua. "This is a good opportunity for the Red Cross to reform its existing management system, including the government supervision and management, the marketing operation of the organization, and its relation with the society." On Wednesday, RCSC president Hua Jianmin spoke at its national anti-corruption conference in Beijing. "Incorruptibility and cleanness are the lifelines of the Red Cross' work in China," Hua said. "Try hard to improve the credibility of the Red Cross in Chinese society." Wang says the RCSC badly needs to regain its credibility. "The organization needs introspection. We're now facing a new world with new technology, where under-the-table transaction is impossible to keep," Wang said. "Charity organizations need to have a sense of crisis, to reform in an open and transparent environment where the public will question the credibility of these organizations all the time." Michelle Phillips and Visqi He contributed to this report.